Chicago seemed in disarray. Skipper Jimmy Wood had been out since before the season started suffering from a serious abscess in right leg.4 Catcher and interim manager Fergy Malone was not with the team (he had missed the train in Philadelphia) forcing players to change positions, further suggesting that it would be an “easy victory” for Boston.5 Boston, on the other hand, was, as the Tribune further said, “strong as usual and seemed like a well-oiled machine”; however, George Wright was replaced at shortstop by Andy Leonard. On a sunny summer day an estimated 10,000 spectators packed Twenty-Third Street Grounds on Chicago’s South Side.6 Due to the late arrival of the Red Stockings, umpire William "Billy" McLean of the Philadelphia Eurekas started the game at 3:35. Boston wasted little time tying the game. Ross Barnes, who had paced the NA in batting the previous two years (.430 and .431 respectively), led off with a hit and scored on Spalding’s drive; Deacon White was thrown out at the plate on the play. Leonard subsequently knocked in Spalding. In the second inning, Barnes, White, and Spalding each drove in a run off hurler George Zettlein, a dependable right-hander who completed all 57 of his starts in 1874, winning 27 of them. The White Stockings regained the lead in the fifth when Myerle, en route to leading the National Association in hitting, (.394), Paul Hines, and John Glenn led off with hits. Following Fred Treacey’s one-out double to make it 7-5, Peters knocked in two more on a single. With runners on first and second, Cuttbert smashed a hard liner to Harry Schafer at the hot corner. Schafer caught it and tagged Peters, who had drifted off the base, to end the frame with the Chicagos leading, 9-5. The sixth inning ended with the score 11-6. Miscues by catchers Cuthbert of Chicago (two passed balls and a wild throw) and White of Boston (one passed ball and a wild throw) contributed to all three runs. This was the era before players donned the “tools of ignorance”; there were no “tools” as catchers played without gloves (as all fielders did), masks, and chest protection. “The Whites got the ‘hang’ of Spalding” in the seventh inning, wrote the Chicago Inter Ocean.8 Following a botched double-play attempt on Cuthbert’s grounder that would have ended the inning, the White Stockings scored five unearned runs. The dagger came with the bases loaded when Glenn hit a single to drive in two runs, giving the Whites a seemingly insurmountable 16-6 lead. Captain ’Arry (as the Boston papers affectionately called player-manager Harry Wright, who was born in Sheffield, England) knew his star hurler had had enough (20 hits and 16 runs, 9 earned). He switched his outfield position with Spalding, and took the mound for one of his six appearances (including two starts) that season. “The change was deadly to the Whites, who were unable to get hold of Wright’s slow delivery,” wrote the Tribune.9 The 39-year-old Wright in his final season as an active player (though he did play in one game in each of the next three years) held Chicago scoreless through the ninth inning. Described as “practically beaten,” Boston mounted a comeback in the bottom of the seventh by scoring five runs on a combination of clutch hitting a bad defense.10 While Treacey and Glenn dropped what the Tribune considered “easy” fly balls, and Peters made a wild throw, Jim O’Rourke, George Hall, Schafer, and Barnes all hit safely to pull Boston to within five runs, 16-11.11 It was “the worst muffing that was ever seen,” opined the Tribune. The Chicago Inter Ocean observed that “the Whites seemed demoralized.”12 Drubbed 29-6 in their last meeting with the Reds, the White Stockings were fully aware of the explosiveness of Boston’s offense, which led the NA in practically every category and averaged a whopping 10.4 runs per game in 1874. With “courage and determination,” wrote the Tribune, Boston came to bat in the ninth trailing 16-11.13 Boston’s comeback commenced with Barnes’s fifth hit of the game, a double to drive in two runs. White hit safely to knock in Barnes, and later scored to make it 16-15. Tension mounted as Boston loaded the bases with just one out. “Everyone expected to see the Whites beat,” wrote the Chicago Inter Ocean.14 But “Charmer” Zettlein (whose moniker derives from a minstrel of the period) reared back to retire O’Rourke on a fly that tied the score, and then Wright. The game went into extra innings, something of a rarity in the National Association to say the least. It was Chicago’s first-ever overtime contest. Boston’s last extra-inning affair had been almost two years earlier when they defeated the Brooklyn Atlantics 17-12 in 11 innings on July 29, 1872. Peters led off the 10th with a double, his fifth hit of the game. He subsequently scored on Zettlein’s hit and George Hall’s bad throw to give Chicago the lead for good, 17-16. The inning ended when Schafer repeated his fifth-inning defensive wizardry by catching Force’s hot liner and swiftly tagging Zettlein for the second double play of the game. The “batting of the Whites throughout the game was magnificent,” exclaimed the Chicago Inter Ocean.16 The victory over the best team in baseball gave hope to the fans, players, and, importantly, principal stockholder Norman T. Gassette and his partner, William Hulbert. 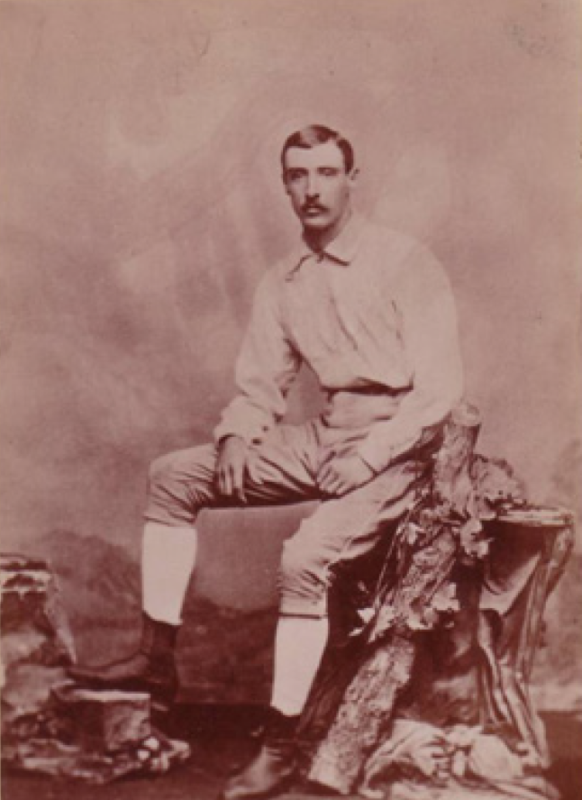 (Hulbert subsequently became one of the founders of the National League, which began play in 1876.) Chicago’s shortcomings thus far in 1874 had perplexed them. In their effort to challenge mighty Boston, they had raided the roster of the Philadelphia Whites near the end of the previous season and had signed Delvin, Myerle, Malone, Treacey, Wood, and Zettlein in a classic case of contract jumping. It finally appeared that their admittedly ethically questionable efforts had paid dividends. Though the White Stockings lost their next game, 12-6 to Boston, two days later, their inspirational victory on the 98th anniversary of the signing of the Declaration of Independence commenced a stretch of 14 wins in 18 games, all but the final win at home in the friendly confines of the Windy City. Chicago’s success came as skipper Jimmy Wood had his leg amputated above the right knee on July 10. According to the Chicago Tribune, Wood had “wasted away” and his bones became “brittle.”17 Amazingly, Wood returned as skipper just five weeks after his operation. 1 “The Fourth. General Celebration of a Delightful Day. The White Stockings Proclaim Their Declaration of Independence,” Chicago Tribune, July 5, 1874: 7. 4 “Local Miscellany. Baseball Gossip,” Chicago Tribune, April 5, 1874: 5. 5 Ibid. Outfielder Ned Cuthbert took Malone’s position behind the plate, second baseman Levi Myerle moved to left field, and outfielder Paul Hines moved to second base. 6 The Tribune estimated that 10,000 were in attendance; the Chicago Inter Ocean estimated the crowd at 8,000. “Sporting News. The Great White Stocking Base Ball Club Scoops the Boston Reds,” Chicago Inter Ocean, July 5, 1874: 9. 7 Chicago Tribune, July 5, 1874: 7. 8 Chicago Inter Ocean, July 6, 1874: 9. 9 Chicago Tribune, July 5, 1874: 7. 12 Chicago Inter Ocean, July 6, 1874: 9. 13 Chicago Tribune, July 5, 1874: 7. 14 Chicago Inter Ocean, July 6, 1874: 9. 15 According to the Chicago Tribune, the game last 2 hours and 20 minutes. The Chicago Inter Ocean gave the game time as 2 hours and 10 minutes. 16 Chicago Inter Ocean, July 6, 1874: 9. 17 “Sporting News. Jimmy Wood Will Never Play Baseball Again,” Chicago Tribune, July 11, 1874: 7.